Ayutthaya was once the capital of the Kingdom of Siam as well as a major trading port and area of commerce. It is located about 80 kilometers north of Bangkok, making it perfect for a day trip from Bangkok whilst visiting Thailand. It takes just over an hour to drive there and is super convenient and totally worth the visit. It was devastated by the Burmese in 1767 and the ruins of the old city now form the Ayutthaya Historical Park, which is an archaeological site with the ruins of palaces, various Buddhist temples, monasteries and statues. It is also a UNESCO World Heritage Site. I particularly found visiting the various Buddhist temples a highlight and would recommend it to anyone as it provides a fantastic insight into the culture, traditions as well as amazing to see the varying designs between the temples as well as different styles of Buddha statues. Ayutthaya is also known for certain dishes and has ample history to tell a brilliant story of its vibrant past. There are so many temples to see, as well as various Buddha statues, the most iconic being the stone Buddha head entwined in the roots of a tree, which is located inside Wat Mahathat. There is also Wat Phanan Choeng, which houses a 19 metre high Buddha statue which is a must see! At Wat Yai Chai Mang Khon you can see a massive reclining Buddha as well as lots of Saffron cloth robed Buddha statues. Wat Phra Si Sanphet is the largest temple in Ayutthaya and is situated in the former royal palace and has 3 distinctive Stupas. It is a must see for the sheer grandeur it has! You can read more about the temples both in Bangkok and Ayutthaya here. The Ayutthaya National Art Museum is really interesting to see the history in Ayutthaya over the eras as well as learn about the various styles and customs. 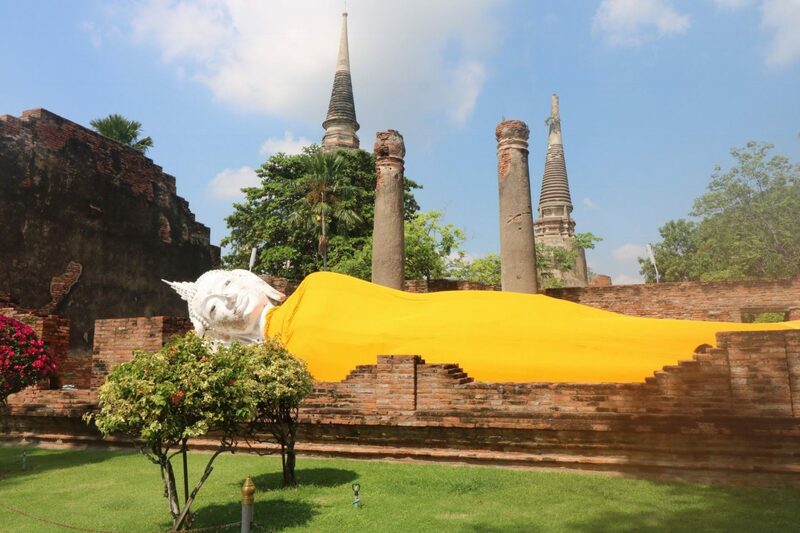 As well as various art, it houses various artefacts which tell the story of Ayutthaya. The grounds are really beautiful too! This is one of the most loved deserts in the city. A thin crepe style Roti is made and then lots of colourful sugar strands are put inside and it is wrapped up. There are lots of street stalls or roadside stalls that sell this and it is really delicious! A must try when in Ayutthaya and it is rather addictive! Another dish Ayutthaya is known for is its large Freshwater River Prawns, which are grilled and just heavenly! If you love seafood this is a must! This is a stunning palace with beautiful grounds, buildings made with intricate designs and is a really interesting place to visit. It is very strict however, so wear conservative clothing and make sure your shoulders and knees are covered. The building I found most interesting was the Chinese style residence built in China and gifted to King Chulalongkorn (Rama V) by the Chinese Chamber of Commerce in 1889. I haven’t heard much about this part of Thailand but it looks amazing! That Buddha Head in the roots of the trees is iconic! Haven’t been to this part of Thailand – looks fascinating!